Vortec engineered blow off nozzles significantly reduce compressed air consumption and noise, compared to open nozzle jets. Using proven Transvector® amplification technology, Vortec nozzles entrain and accelerate free surrounding air, resulting in air flow volume up to 25 times more than the volume of compressed air, giving 25 times the blow off capability at a significantly reduced energy usage and lower operating cost. And while reducing air consumption, Vortec nozzles also reduce noise levels by as much as 60%. 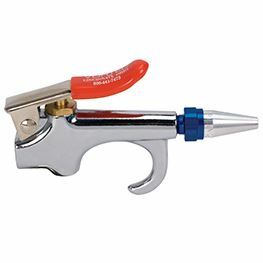 Airstream @ nozzle: 5/8 in. Airstream @ 12": 3-1/2 in.